There is a direct line between the U.S. Federal Reserve’s December interest-rate increase and last week’s announcement that Stephen Moore is set to be nominated to an open seat on the central bank’s Board of Governors. The Fed needs to start playing a smarter political game sooner rather than later. The risk to its independence has probably never been higher. Probably best to first step back to last week’s FOMC meeting. That event concluded with the scene of Powell & Co. running backwards as fast as is possible for central bankers to try to correct the error of the December rate hike. As expected, the Fed downgraded their assessment of the economy and held rates steady. Less expected was the sharp downward revision to the dot plot with now eleven of the seventeen participants anticipating no rate hikes in 2019. The median expectation is for another hike in 2020 and then that’s it for this cycle. Note the median rate path doesn’t even get rates up to neutral. In other words, the Fed no longer thinks containing inflation requires restrictive policy. That last point resonates as a substantial change to the outlook. The Fed’s models typically don’t work that way. That call for restrictive policy comes from the need to push unemployment to its natural rate to contain inflationary pressures. Those inflationary pressures have apparently disappeared now that the rate forecast has flattened out despite unemployment remaining below its natural rate. What’s going on here? The persistence of low inflation has finally become too much for the Fed to dismiss, especially now with the economy decelerating. They can’t justify it anymore as a transitory phenomenon so it must be attributable to excessively high estimates of the natural rate of unemployment (which came down again to a now 4.3%) or, more worrisomely, eroding inflation expectations. Powell emphasized inflation concerns in the press conference and acknowledged that the Fed had not met the symmetric inflation target in any convincing way. That’s something of an understatement; if anything, Fed policy has very clearly treated 2% as a ceiling in the actual application of policy. It’s a major challenge. It’s one of the major challenges of our time, really, to have inflation, you know, downward pressure on inflation let’s say. It gives central banks less room to, you know, to respond to downturns, right. So, if inflation expectations are below two percent, they’re always going to be pulling inflation down, and we’re going to be paddling upstream and trying to, you know, keep inflation at two percent, which gives us some room to cut, you know, when it’s time to cut rates when the economy weakens. And, you know, that’s something that central banks face all over the world, and we certainly face that problem too. It’s one of the, one of the things we’re looking into is part of our strategic monetary policy review this year. 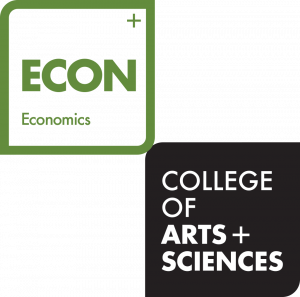 The proximity to the zero lower bound calls for more creative thinking about ways we can, you know, uphold the credibility of our inflation target, and you know, we’re openminded about ways we can do that. I see two big points here. The first is that the Fed suddenly remembered that policy rates remain mired near the zero lower bound. They seemed to forget this point over the last year, too excited by the prospect of raising rates to remember that even at the projected end of rate hikes they would lack the room to mount a traditional response to a full-blown recession. The second point is that fading inflation expectations mean a.) they are “paddling upstream” to hold inflation higher and b.) they have “room to cut” when the economy weakens. My interpretation of this new inflation realization is that the Fed has a fairly low bar for a rate cut; see my latest for Bloomberg Opinion. Since that meeting, the yield curve continues to flatten and invert with the 10s3mo spread going negative last Friday. 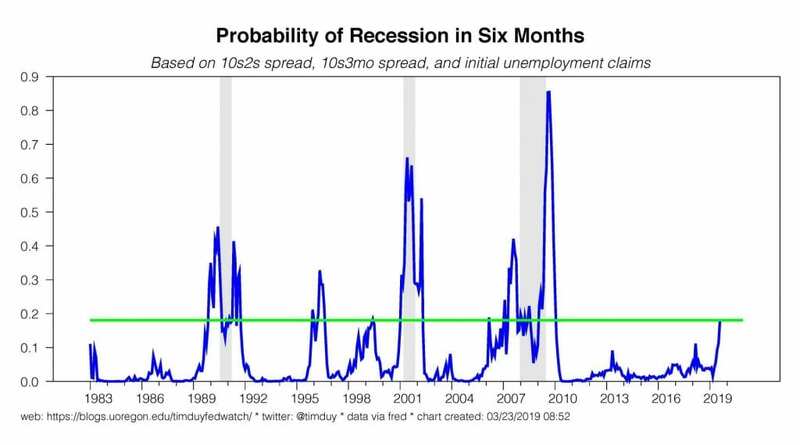 An inverted yield curve is a well-known recession indicator. As a market participant, you have a choice. Either embrace that relationship in your analysis or reject it on the basis that any signals from the term structure are hopelessly hidden by the massive injections of global quantitative easing over the last decade. 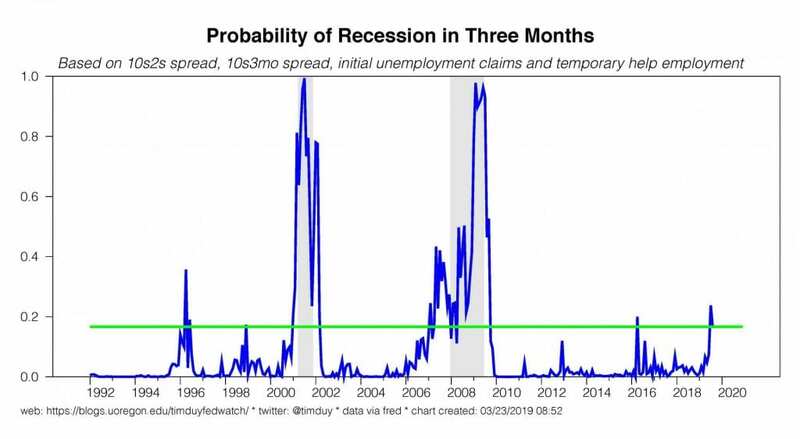 In either case I get the same takeaway: The risk of recession has risen to levels that demand attention from the Federal Reserve. In the two cases of similar spikes in the 1990s, a recession was avoided by the rapid response of the Fed in the form of rate cuts. The times that response was lacking, a recession followed. So now I switch from analyst to commentator: The above leads me to the conclusion that the Fed needs to get with the program and cut rates sooner than later if they want to extend this expansion. Given inflation weakness and proximity to the lower bound, the Fed should error on the side of caution and cut rates now. Take out the insurance policy. It’s cheap. There will be plenty of opportunity to tighten the economy into recession should inflation emerge down the road. What would delay that rate cut? Data. A yield curve inversion is a long leading indicator. Sure, the data is softer. But soft enough to cut rates? Not necessarily from the Fed’s perspective. Moreover, cutting rates now means admitting the December rate hike was an obvious error. The Fed hates admitting error. Speaking of errors, the December rate hike is turning into one for the books. Not just on the economic side, but also the political side. I can already hear the howls of the monetary policy community shouting me down with claims of Federal Reserve independence and how nothing has changed in the past two years and that of course the Fed will walk away from the Trump years unscathed. I think that hypothesis is a.) completely wrong and b.) already proven to be completely wrong. Monetary policy independence is not a law of nature. There is no special 11thcommandment “Thou shalt not interfere with the central bank.” Independence only exists so long as a.) it is an established and followed norm and b.) the central bank continues to deliver results. The second part is straightforward. The Fed hasn’t delivered on inflation as Powell admitted last week, which by itself is a problem. That problem would be compounded by delivering a recession in an effort to fight a nonexistent inflation problem. You want to stay independent, you have to do your job. After years of watching the Bank of Japan, you would think the Fed had picked up a thing or two on this topic. On the first part, President Trump shattered the norms last year when he began haranguing the Fed. That didn’t work, or perhaps it even backfired. The Fed would never admit it, but it is hard not to conclude that one factor behind the December rate hike was a perceived need to establish independence. If so, that was a clear case of cutting off your nose to spite your face. On the economic side, there was no cost to taking a pass and coming back to the topic six weeks later. This would have had the political benefit of giving Trump what he wanted. Two birds with one stone, as they say. Consider the current situation. The Fed is likely to be cutting rates anyways. And now the unimaginable has happened: Stephen Moore is nominated to a spot on the Federal Reserve Board. I don’t think I need to go into the history here, but if you are new to the game you can check out this by Jonathon Chait and this by Noah Smith. We might as well nominate my cat for that other open spot. And remember the Herman Cain thing? Two years ago, these people wouldn’t have been on the table. Now they are. You might reasonably say that Moore won’t make it through vetting and the Senate. That’s kind of beside the point. The real issue is the openness with which this administration is willing to place a political operative into the Federal Reserve. Just like any other agency. You should also see it as a blow to Powell’s influence. I suspect that Powell initially had considerable say over the choice of governors. That is how you can explain the nomination of Nellie Liang who, qualified as she is, couldn’t make it out of committee. Now, does anyone think that Powell signed off on Moore? Anyone? Bueller? My guess is that what happened here is Trump has torn up any agreement he had with Powell to allow the latter to decide on appointments to the Board. And Trump isn’t going to trust Mnuchin, who gave him Powell. So now Trump is going to do what Trump does, and that means nominating people he knows are “his guys.” And once the norms are shattered, can they be rebuilt? What will the next president do? The game has changed on many fronts, but I am thinking the raw application of political influence is blindsiding the Fed. They should have seen this coming, but I suspect they were too shielded by the central banking community to see it coming. Bottom Line: I am going to break this into three parts, all market relevant in various ways. First, what I think the Fed is going to do. They are scrambling to recover from the December rate hike and that scramble leaves the Fed positioned to cut rates. Second, what I think they should do. They should cut rates sooner than later; the cost of insurance is low. Third, what I think about the political climate and the Fed. The political climate has changed, and the Fed needs to change with it; don’t buy into the story that the Fed is independent and will walk away from this as the only agency smelling like roses. The failure to adapt is already having consequences, most obviously in who is now considered qualified to lead the central bank. The Federal Reserve this week effectively acknowledged that its final interest-rate hike of 2018 was an error. In trying to fix that error, policy makers have quickly shifted gears from forestalling inflationary pressures to supporting inflation and extending the expansion. The implication for market participants is to expect that the next Fed move is much more likely to be down than up. Fed policymakers from around the nation once again descend upon Washington D.C. to ponder the path of monetary policy as the economy eases down from the fiscal-stimulus boosted pace of 2018 to something more consistent with what the Fed believes to be sustainable growth. The expectation is that the Fed will leave policy rates unchanged and will reiterate their intention to remain “patient” while awaiting the data that will guide their next move. Still, there will be plenty of excitement even if rates hold steady. More important will be the new set of forecasts, which will likely shift to reflect the “patient” stance adopted at the January FOMC meeting. In addition, I anticipate the Fed will announce a plan to wind down the balance sheet runoff. In addition, the number of sectors contracting rose higher as would be expected in a slowing economy. 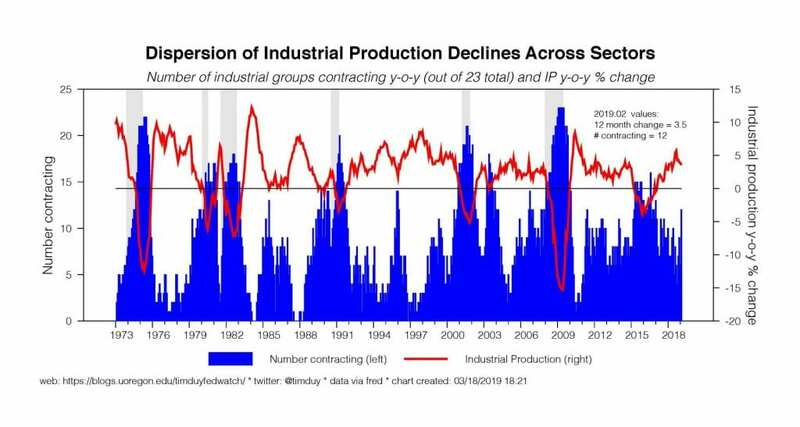 Remember though that during a recession, typically the declines in industrial production are deeper and the dispersion across sectors is greater. We also should not ignore the lesson of 2015-16, during which a manufacturing shock remained fairly well contained. In short, the numbers again suggests softening, not recession. 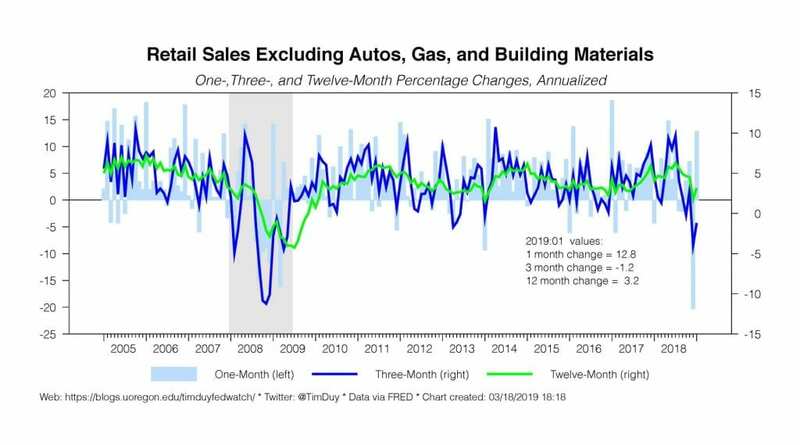 My expectation at this point is that when the recent volatility passes, retail sales stabilize closer to the 2015-16 pace than the 2017-18 pace. 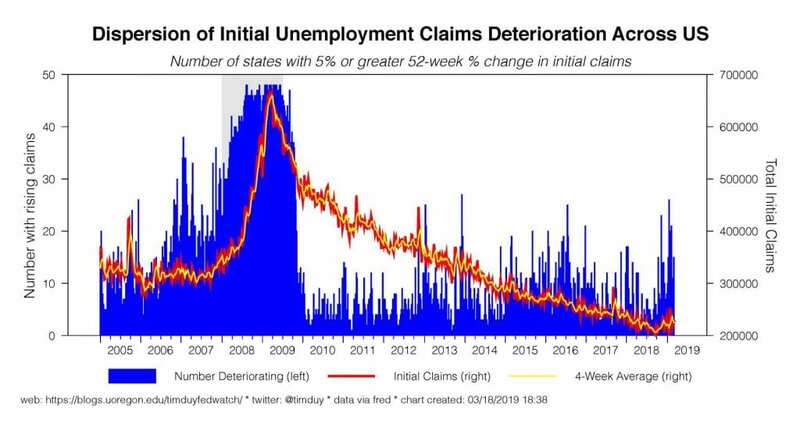 Here again, the modest rise in claims and widening of deterioration across states is consistent with a slowing economy, but the overall pace of worsening still remains short of recessionary. I suspect the above data will support a downgrade in the median growth forecast for 2019 to something closer to 2%, close to the median longer run forecast of 1.9%. That would mean the economy would fall to its sustainable growth rate about a year ahead of what the Fed expected in December. With growth downshifting, inflation soft, and rising concerns about deteriorating inflation expectations, the Fed has the opportunity to sharply pull down the expected path of rate hike and wipe out the two 2019 rate hikes expected at the December meeting. This would be consistent with recent communications and I suspect that the Fed would not want to whipsaw markets with a set of projections that was markedly different from what the mantra of “patience” they have been chanting all up and down Wall Street and Main Street. A shift downward in the dots is the expectation; the risk is that the gap between longer run unemployment and forecasted unemployment remains wide enough to keep a sufficiently large subset of FOMC participants thinking that they still need to snug rates higher that the median dot calls for another hike this year. More interesting to me, however, is the possibility that at least one dot anticipates a rate cut in 2019. 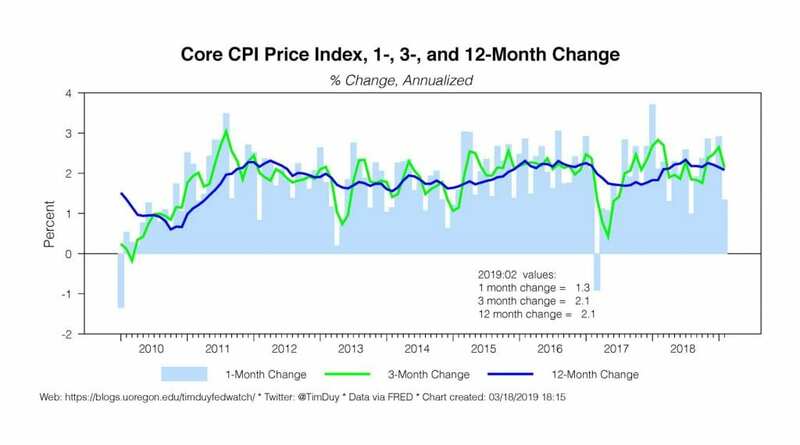 I would not be surprised if one FOMC participant thought a slowing economy with already soft inflation numbers would more likely that not justify a rate cut by the end of the year. Bottom Line: I expect the Fed will revise their projections to reflect the dramatically more dovish tone taken since the ill-fated December rate hike. Such a move also appears consistent with incoming data. Moreover, Fed speakers have given little reason to believe that market participants have taken an overly dovish view of policy. Altogether, that means the dots will reveal a marked downshift in the expected path of rate hikes. If we don’t see that, we will be pondering the cause of yet another communications divide between central bankers and market participants. As expected, the broad trends in January’s employment report reversed in February. 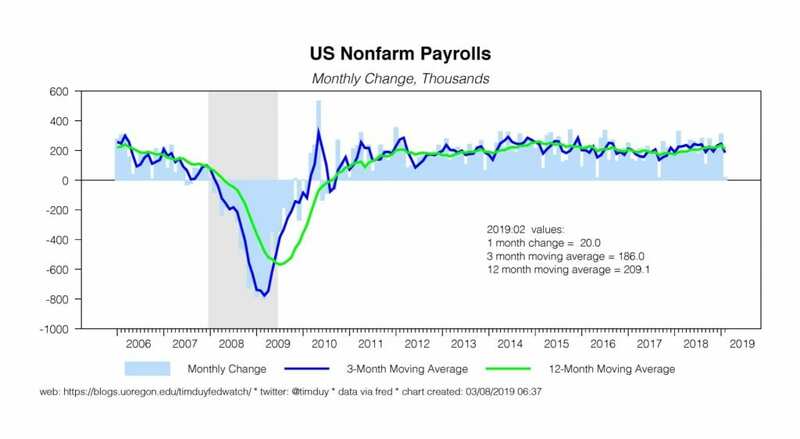 That said, growth in Nonfarm payrolls was a meager 20k. Per usual, you need to make a choice. Did you think the 300k+ number in January represented the true trend? Do you think the 20k February number represents the true trend? Or was February more likely just the occasional pothole that happens? I lean in the latter direction; I suspect the Fed will as well. This has been a good leading indicator in the past two cycles and I have no reason to think it won’t be again. My short story is to analyze the headline payroll number in context of the overall data flow. 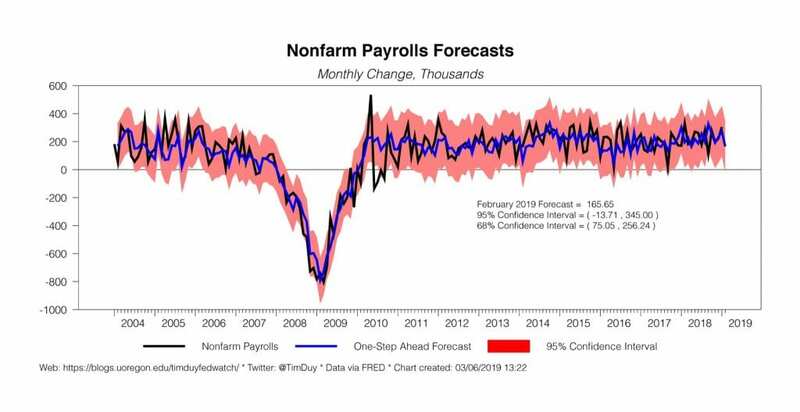 If temp helps was rolling over, if the ADP number was equally soft, if consumer confidence were plunging, I would be more concerned about the soft employment gain. Solid labor force growth over the past year helped stabilize the unemployment rate and supported the hypothesis that the economy was not overheating. 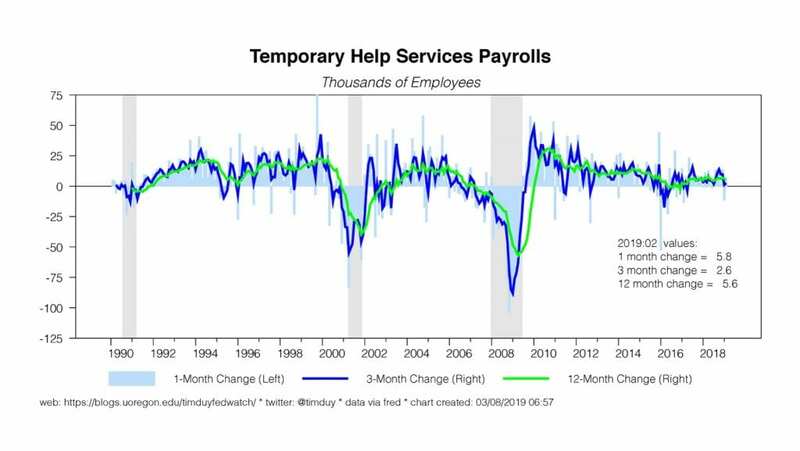 A sustained slowdown in labor force growth in the context of still upward pressure on labor demand would call that hypothesis into question. That said, one month does not make a trend. The twelve-month change was at a cycle high of 3.4%. A solid number but not one that would rattle the Fed. They are most likely to see it as consistent with productivity growth. 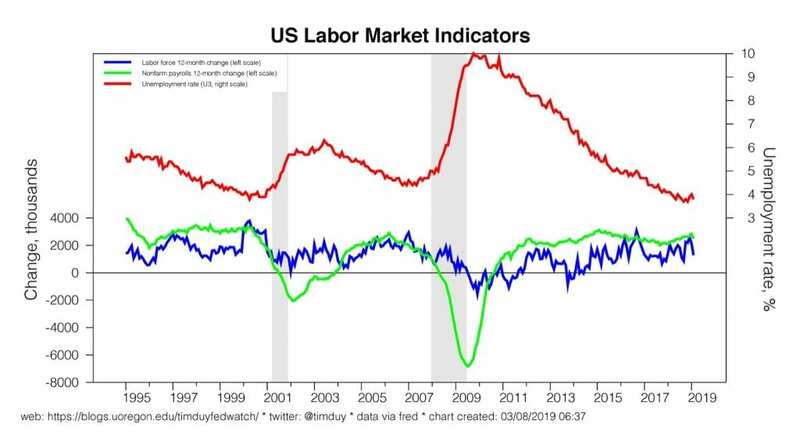 Bottom Line: Looking through the noise, the labor market most likely retains its Goldilocks aspects of solid job growth, low unemployment, and improving wage growth. Note that we should anticipate some slowing of growth over the next year is the economy slows as expected. 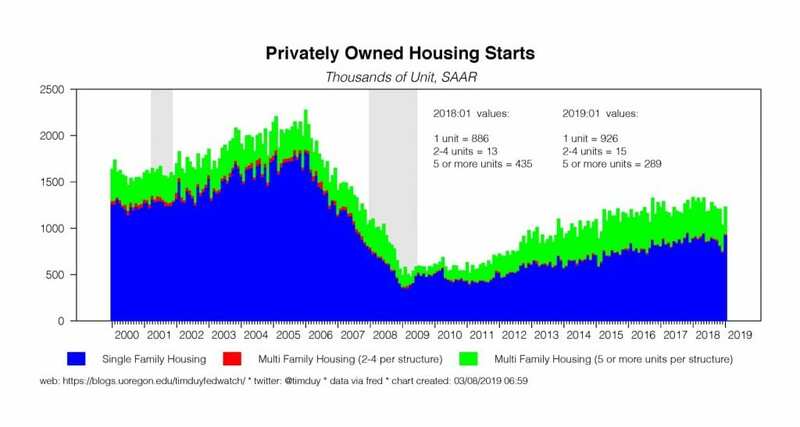 Housing looks to remain on fairly stable ground but don’t expect miracles as the sector is not likely to provide a large boost to growth at this point in the cycle. The February employment report will be released Friday. The most likely outcome is the direction key variables in the report mirror their January outcomes. It is unlikely that the outcome of the report will, by itself, have much impact on monetary policy now that the Fed is in “patient” mode. Absent a dramatic near-term shift in the pace of activity, the Fed will focus on the totality of the data over the next few months before making a decision about the next policy move. The unemployment rate will likely edge back down (consensus expectation is 3.9%) now that furloughed government workers and contractors are back on the job. Importantly, the Fed will be keeping a close eye on labor force participation; solid gains in participation are holding unemployment fairly constant over the past year, which lessens any residual concerns about overheating. 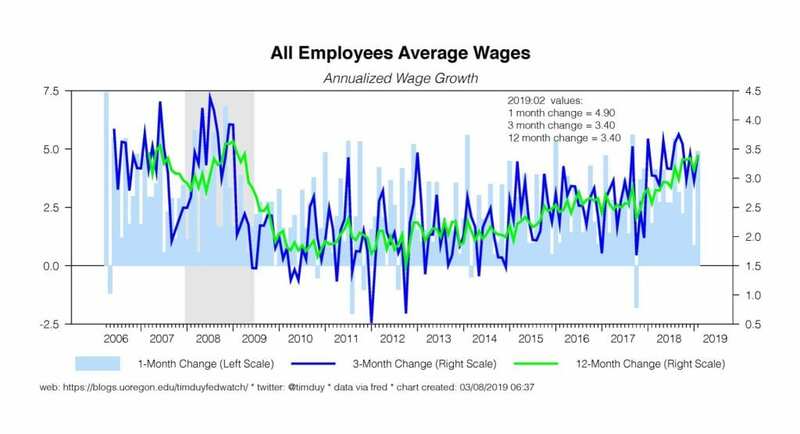 Wage growth is expected to pick up and drive the year-over-year growth to 3.3%. Wage growth in that zone would not be considered inflationary by Fed policy makers. Overall, the expectation is that we continue to see the labor market deliver Goldilocks outcomes of continued job growth, stronger labor force growth, low unemployment, and improving wage growth. That kind of combination will keep the Fed happily on the sidelines. Reasonable departures from this story on either side would likely be met with a shrug. 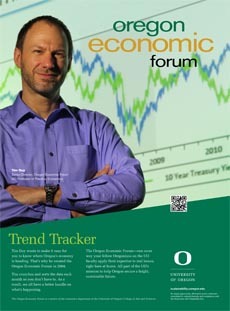 The data after all is volatile and the Fed has already been clear they are in no rush to make another policy decision. 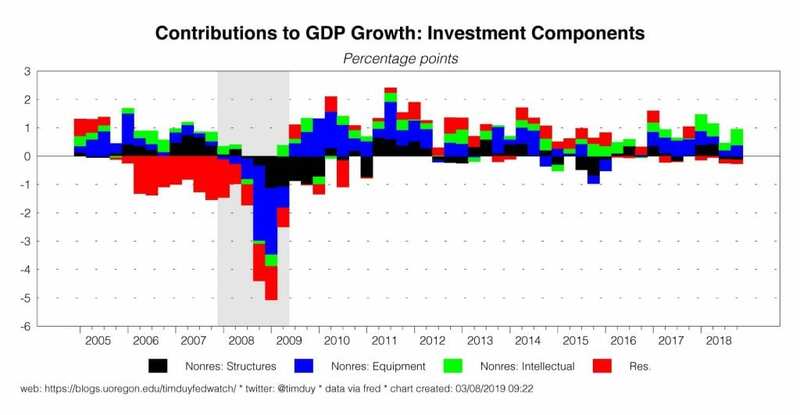 Three developments contribute to this view: a downturn in global growth, heightened geopolitical uncertainty, and the effects of tighter financial conditions. From the perspective of monetary policy, the overall picture of the economy is about as good as it gets: very low unemployment, sustainable growth, and inflation just about at our 2 percent goal. Given this favorable situation, when you look at monetary policy, things are looking pretty normal as well. My current estimate for r-star is 0.5 percent, so when you adjust for inflation that’s near 2 percent, the current federal funds rate of 2.4 percent puts us right at neutral. Williams is now back to his old self. Remember, just a few months ago he was telling us not to pay too much attention to r-star. Now r-star is back to its old place at the beginning, center, and end of Williams’ analysis. The policy implications are at this point well known – it’s all data dependent. If growth looks faster than anticipated, they may need to snug policy higher a bit. If growth falters, rates are heading down. Bottom Line: The Fed generally believes they have policy and the economy just about where they want it, not too hot, not too cold. The employment report is expected to fall in line with that view. Although the U.S. government said the economy expanded at a faster-than-expected rate of 2.6 percent last quarter, there’s little doubt that activity has slowed considerably this year. Market participants should prepare themselves for an environment going forward where growth in any one quarter might be negative in the next even if the economy avoids recession. The Federal Reserve Bank of Atlanta’s initial estimate of first quarter 2019 growth is a meager 0.3 percent. That kind of number will generate plenty of recession warnings. Moreover, it doesn’t take much imagination to push that estimate below zero. 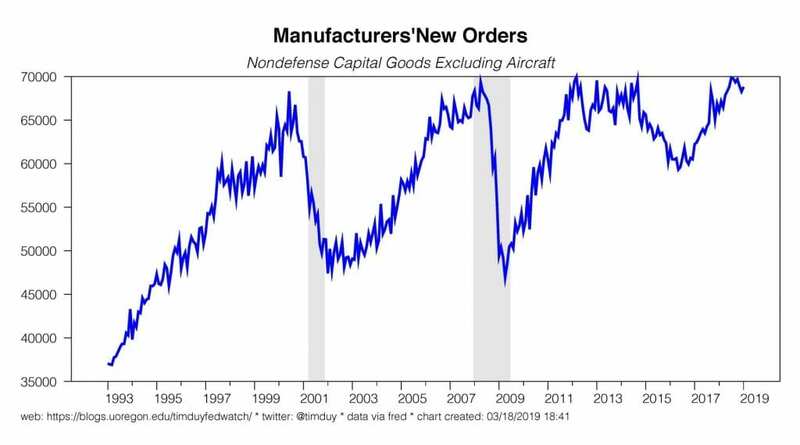 But would a weak first quarter number signal a recession is underway, or even close at hand? Services are a much larger portion of the economy than manufacturing. 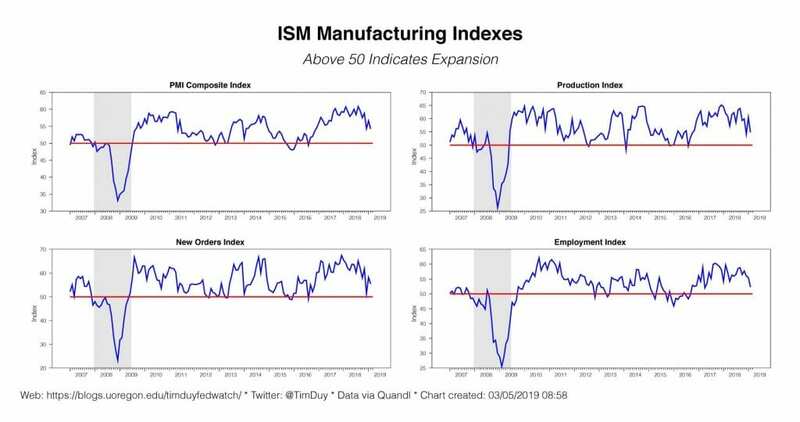 We have many cyclical indicators of the latter, but if manufacturing is less important than the past then weighing those indicators too heavily in our analysis will only lead to an unjustified bias toward recession calls. This is what happened in 2015-16 when the threatened recession failed to materialize. Also, don’t be fooled into thinking this is “lagging” data. 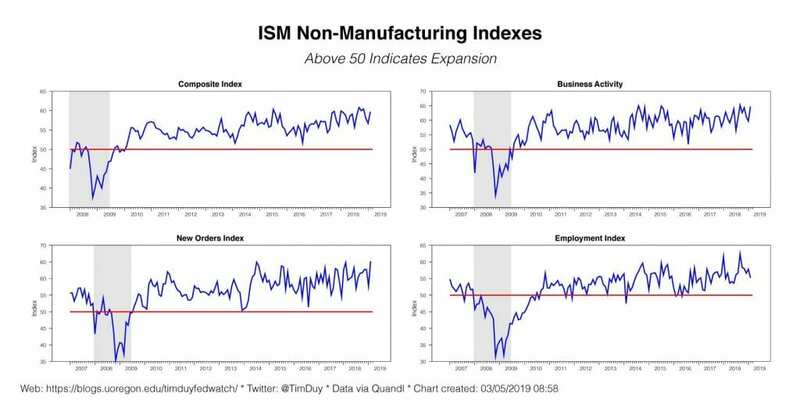 It’s just a couple of weeks old and realistically, if this recessionary slowdown started in the fourth quarter, this ISM data should be much weaker already. Bottom Line: Be careful with some of the old tricks as they are likely less relevant in the new economy.